My little brother adores Toy Story, and this year, he was having a “Star/Space” themed party. I used a template and cut out all the pieces and assembled them on a cooled, 13″ by 9″ vanilla cake. I did a quick crumb coat and put the cake in the freezer for about 30 minutes. (TIP: This step is pretty much ESSENTIAL with this cake! And when you are doing the crumb coat, don’t worry if there are a lot of crumbs in your frosting or if this step looks messy, because only the last coat’s appearance matters). So after I got the cake out of the freezer, I did a final coat, which can be a little difficult, considering all the dimensions of this cake. The final coat does not have to be perfectly smooth, anyway. After I was done frosting, I cut some purple and green Sprees in half and put them upright along the edges of the cake. I just used a knife and a cutting board, and it was pretty easy. I used some purple colored icing, and piped on a few highlights, and used some more green Sprees to decorate. 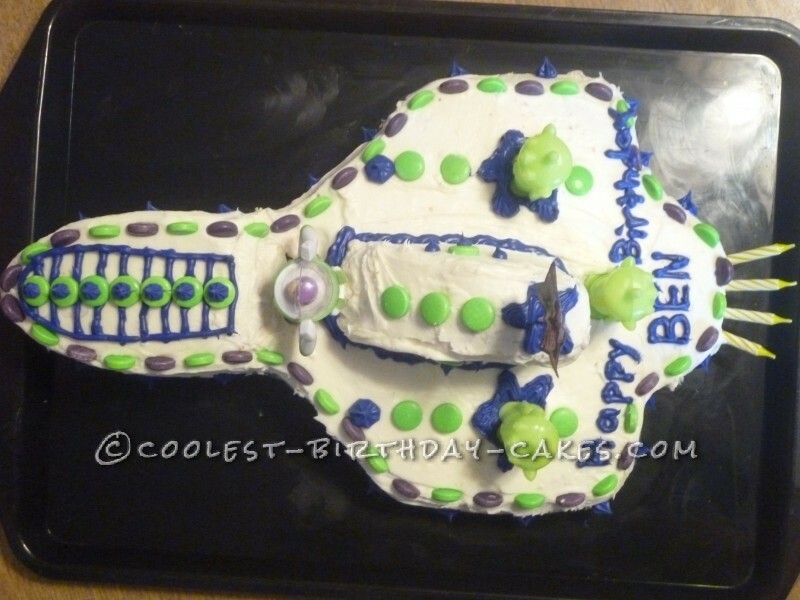 I stuck in a mini Buzz action figure between the spaceship fin and front, and piped on some purple stars on the sides. 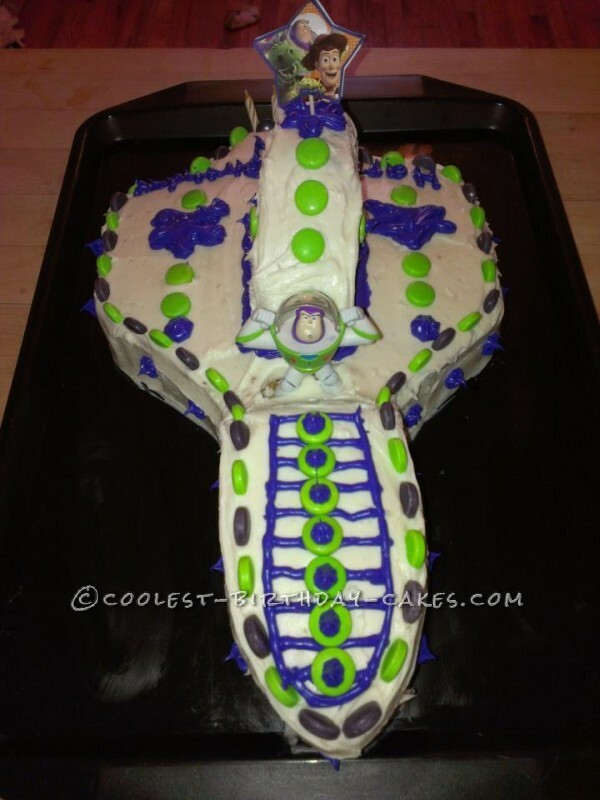 I finished this cake off with 4 yellow candles sticking out of the back of the cake, and when we lit them, it looked like the spaceship was about to take off! I used 4 because my brother was turning four, but you can put up to about 6 or 7 if you put them close together. 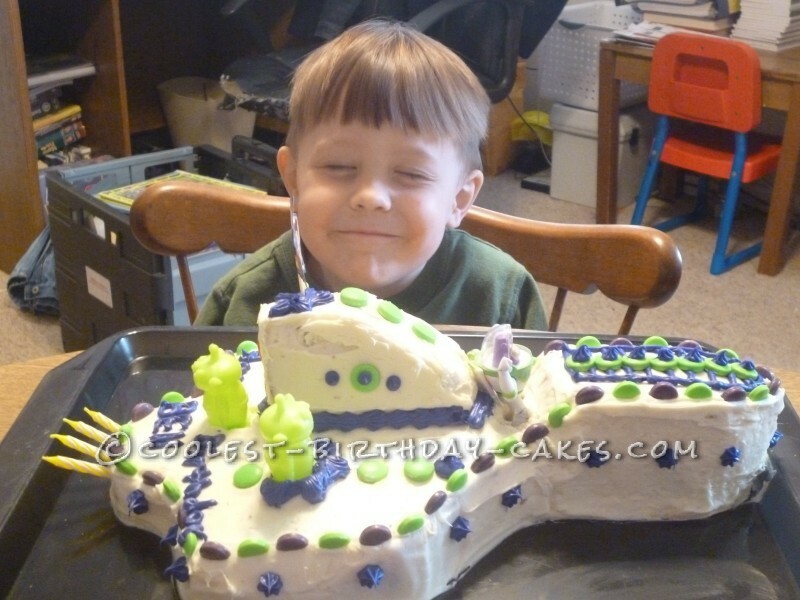 If you are making this cake for a child over that age, you can just stick with the ideal number of 3 candles in the back and stick some more around the cake, or just stick with the 3. I used yellow candles, because that was what I had, but you could use any color you like, though I would suggest red, yellow, or orange, to get the “fire” effect. My little brother LOVED this cake and its probably one of the best I’ve made yet. Here are some more pictures that I took of the cake!